Finding new hip places is a great joy for university students. As gentrification gets worse, more and more people are starting to look for relatively less crowded and unique places to have fun and enjoy a moment of peace. Although the places could seem to be slightly off the mainstream, they are gaining popularity among young people. SNS such as Facebook and Instagram are becoming great guides to finding the perfect spots to spend time; they became better platforms for reviews because of the pretty photos. The Hanyang Journal introduces three places that are worth a visit: a book store, a bar and a cinema. 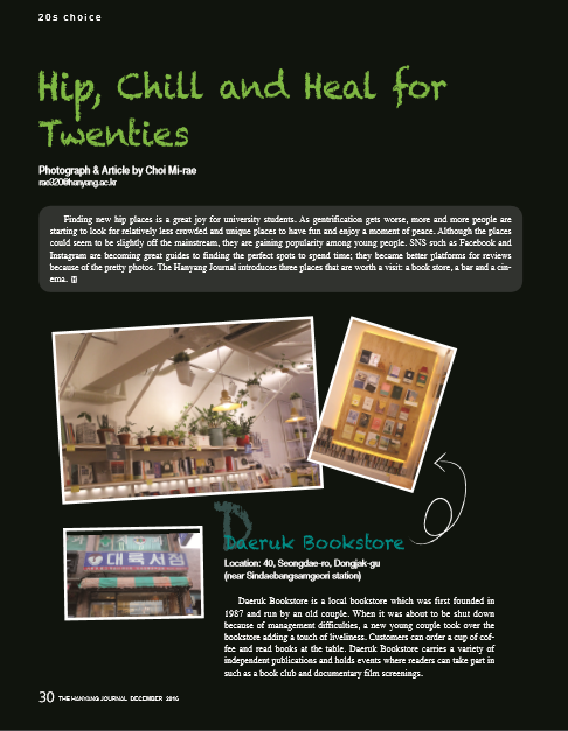 Daeruk Bookstore is a local bookstore which was first founded in 1987 and run by an old couple. When it was about to be shut down because of management difficulties, a new young couple took over the bookstore adding a touch of liveliness. Customers can order a cup of coffee and read books at the table. Daeruk Bookstore carries a variety of independent publications and holds events where readers can take part in such as a book club and documentary film screenings. The sign in front of the store clearly says ‘Welcome only those who want to rest peacefully’. Oonoo is an eastern bar with a quiet and calm atmosphere. They only take a maximum of two customers at a time as, this bar is mainly for customers who enjoy relaxing by themselves. Eleven different dishes are on the menu and the Soju that is made of barley is the most popular alcoholic beverage. Cinecube is a cinema that screens art films from various countries. 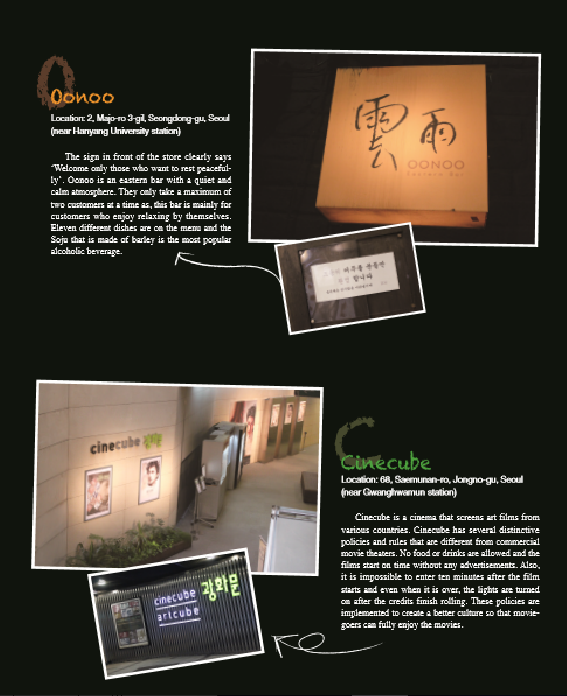 Cinecube has several distinctive policies and rules that are different from commercial movie theaters. No food or drinks are allowed and the films start on time without any advertisements. Also, it is impossible to enter ten minutes after the film starts and even when it is over, the lights are turned on after the credits finish rolling. These policies are implemented to create a better culture so that moviegoers can fully enjoy the movies.